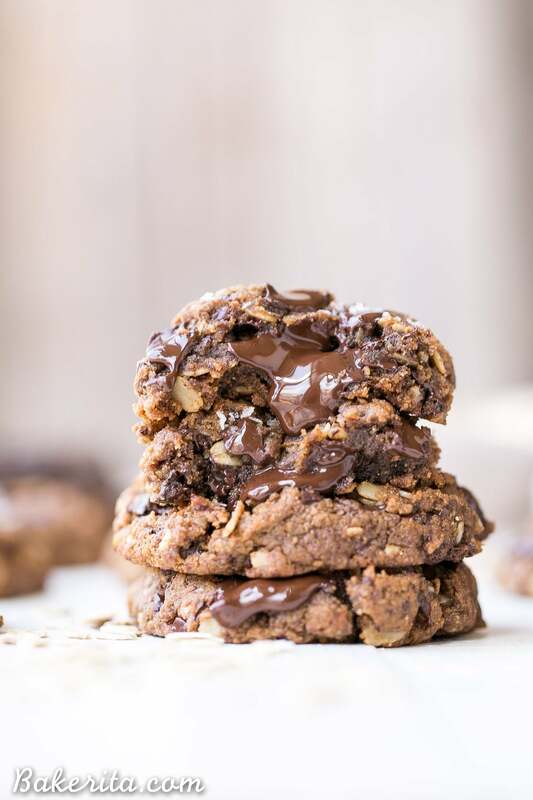 These Oatmeal Chocolate Chip Cookies are gooey in the center with crispy edges and big chocolate chunks, just as the best cookies are! 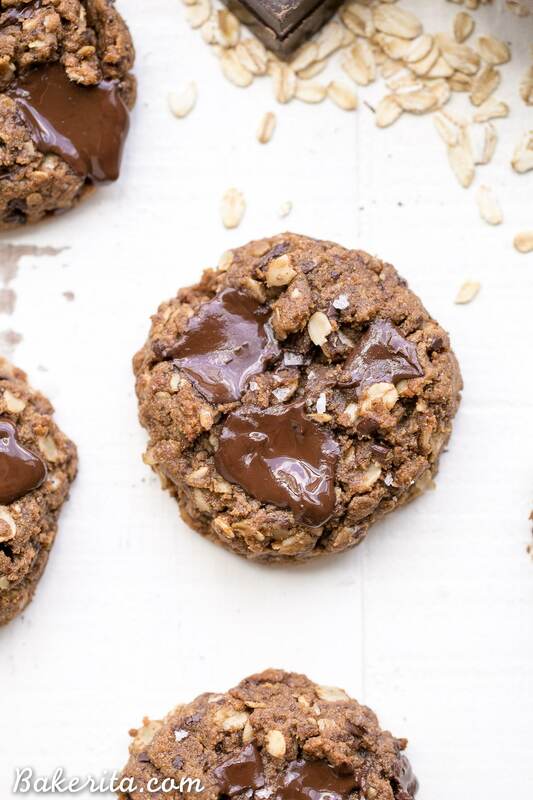 These delicious cookies are gluten-free, refined sugar free, and vegan. Hi friends, happy Monday! As I’m writing this, I’m sitting in the coffee shop right by my apartment…but when you’re reading this, I’ll be floating on a catamaran in the Caribbean, hopefully soaking up some rays  the forecast says it’s supposed to rain, but I’m hoping it changes it’s mind and we end up with sun all week long. I’m going with my mom’s whole family and we’re piling on a big boat for the week to float around, hang out and enjoy each other’s company, and soak up our beaaautiful surroundings. I’m going to be gone for the whole week, so don’t mind me if I’m late responding to comments or social media…I do believe I’ll have Wifi on the boat, but let’s be honest; I’m not going to want to be sitting and staring at my phone when I could be sitting and staring at clear blue waters and sandy beaches. I’ll stop making you jealous with talks of sunshine and sand, and instead talk about the most important matter at hand: oatmeal chocolate chip cookies. My lifelong best friend Paige was at my apartment a few weeks back, on break from law school, helping me with a shoot (and helping me drink the results) and hanging out. 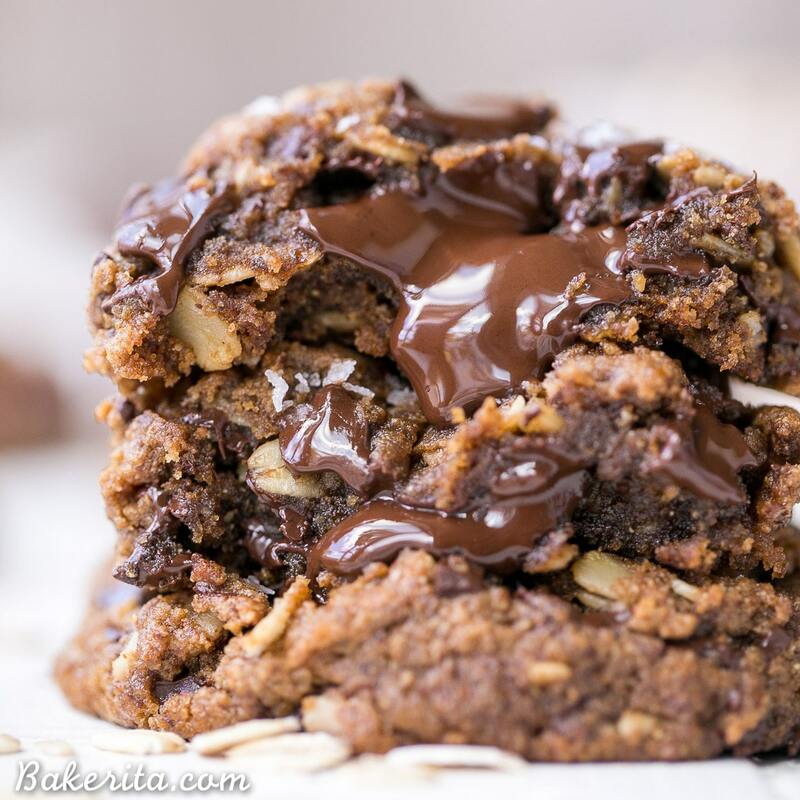 Oatmeal chocolate chip cookies have been her lifelong favorite, and when I asked her for recommendations and she said those, I did a quick brain scan and was surprised to realize I have no gluten-free oatmeal cookies on here. That, my friends, is a tragedy that needed to be rectified ASAP. I got to work, and ended up adapting the new coconut flour chocolate chip cookie recipe that I recently posted into an oatmeal chocolate chip version because I loved them so much. This version obviously isn’t paleo because of the oats, but it is gluten-free, refined sugar free, and vegan. 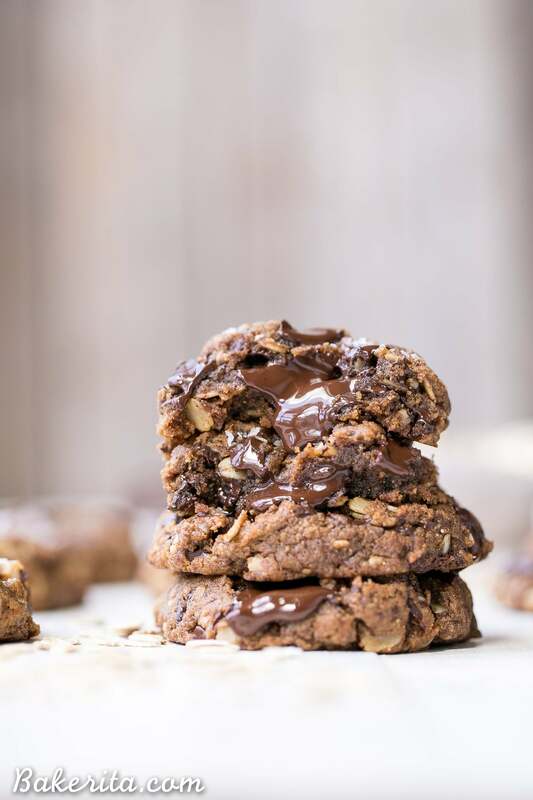 Almond butter acts as part of the base, and I think it’s that addition of almond butter that helps these cookies stay so soft and gooey, unlike so many cookies recipes that use coconut flour. In fact, the first time I tested this recipe they were too gooey, I ended up having to add a bit more coconut flour to the recipe so they’d hold together better. As always, I kept my chocolate chunks giant and super dark. Since my Whole30, my sweet tooth has been less rampant, so I’ve been using 72% or 80% dark chocolate instead of semi-sweet. If you prefer things less sweet too, I’d keep the chocolate dark, and you could even cut down the sugar a bit if your tastebuds prefer. ½ teaspoon baking soda use 1/4 teaspoon if using sunflower seed butter - helps prevent the cookies from turning green when they cool! Preheat the oven to 350ºF and line a cookie sheet with parchment paper. In a bowl or stand mixer, beat together the coconut oil, nut butter, and coconut sugar until smooth. Add the flax eggs and vanilla and mix until smooth. Add the baking soda, salt, coconut flour, and rolled oats to the wet ingredients. Mix until well incorporated. Fold in the chopped dark chocolate. Use a cookie scoop to form cookies and place 2” apart on the prepared baking sheet. Press down slightly to flatten - note that the cookies won’t spread very much, so press them down to the thickness you prefer. Sprinkle with a bit of flaky sea salt if desired. Bake for 10 minutes or golden brown around the edges. Let cool completely on the cookie sheet. Enjoy! Super yummy! These cookies look perfect! Hope you’re having an AMAZING time in the Caribbean, Rachel! Sounds like a blast! As do these cookies….mmmm! I want that entire stack with all of that melty chocolate. Sounds like the perfect dessert for a Monday! OMG!! These look delicious, definitely giving my mom’s cookies a run for their money! Wish I was with you! Have so much fun on your trip!! I hope the weather is gorgeous for you! And these cookies look just scrumptious!! These cookies are just perfection! Hooray for fabulous vacations with family, Rachel! Your trip sounds just fabulous… I could use some sun on my pasty white skin about now! 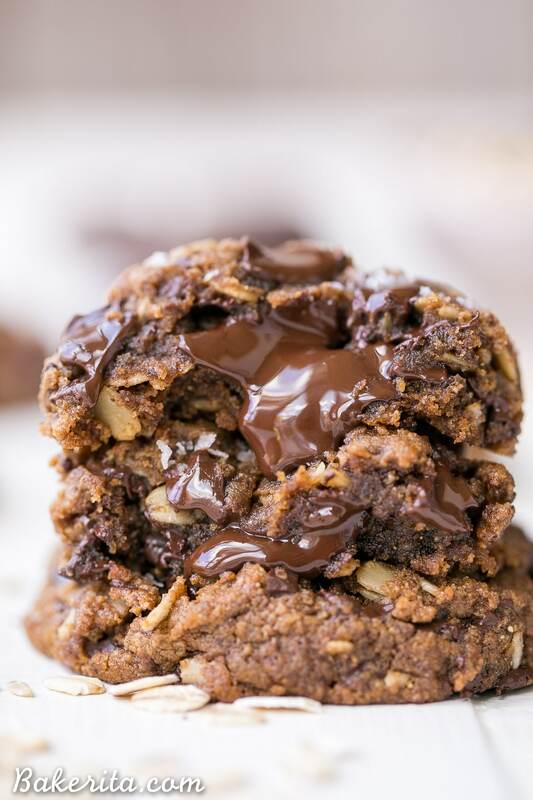 :D These cookies are fabulous and I’m giving a nod to the dark chocolate… yes please!! Delicious work my dear! You always kill it with the gooey chocolate. 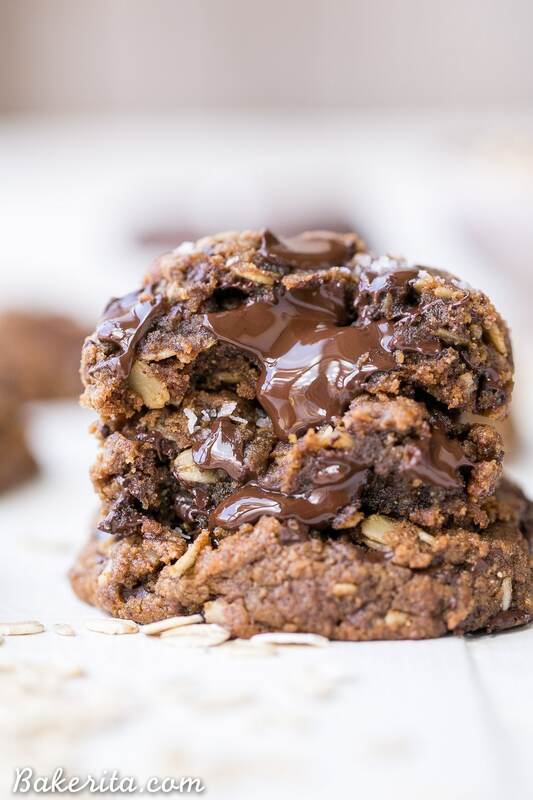 These oatmeal cookies look super delicious and I love that they’re GF and vegan! I thought your Vegan Paleo Choc Chip Cookies from a couple weeks ago couldn’t get any better, but these may just take the #1 spot! Have a lovely trip and soak up some sunshine for me! No way. These look like little balls of chocolate heaven. I cannot WAIT to try these! Omg these cookies, I need them in my life! Can they be more perfect?! Thank you so much Lili! These cookies are so gooey and amazing!!!! ahhhhh! I made these tonight for a dinner party and everyone loved it. They thought serving in one large skillet was fun! I did have to bake it about 5 minutes longer when I used a 10 inch cast iron skillet. I also used salted almond butter. So glad it was a hit, Corey! Thanks for your feedback. WOW. I just made these and they are inCREDIBLE. I made a couple changes: I used real eggs instead of flax as I’m not vegan, and substituted tahini for the almond butter. The tahini does add a touch of nuttiness/its own tahini mojo but it isn’t overpowering. Use good dark chocolate and don’t skip the 1/2 teaspoon of salt – it really puts this recipe over the top. The cookies browned up so beautifully in the oven, and they are phenomenal eaten warm. Thanks for such a great recipe, I will definitely be making these again! So thrilled you’re loving the cookies, Claire! Thanks for much for sharing your changes and feedback. Enjoy! These cookies are amazing! I recently made the switch to gluten free and dairy free for health reasons, and the hardest part was walking away from all the baking I used to do. I’ve tried a few different recipes for chocolate chip cookies that are gf/df and these are by far the best I’ve made! Thank you for all the recipe selections!! So thrilled you’re enjoying them Laura!! :) hope you find many recipes that you love to satisfy all your gluten-free and dairy-free baking needs! I made these today and something went wrong. They spread out completely, almost paper thin. I used peanut butter instead of almond butter and real eggs instead of flax. I used an almond and coconut flour blend. I even added twice the amount of flour called for because i thought the dough looked wet. Still pancake flat. Any suggestions? They WERE tasty though! Hi Laura, this recipe was developed to be made as written, so when many of the ingredients are changed, the same result can’t be guaranteed. Sorry you had trouble! So thrilled you’re loving them Cass, and that they’re able to satisfy your oatmeal cookie cravings :) thanks so much for your feedback! Hi ! the taste is so good but mine didn’t hold together well. I’m thinking it’s because the coconut oil was too melted? I also used chia eggs instead of flax. Hi Sarah – yes the coconut oil should be a texture similar to softened butter, not melted, so that definitely could’ve been the case. I haven’t used chia eggs so not sure how that would’ve affected things. Do you have to use flax eggs, or can you use real eggs? I’ve only tested with flax eggs but real eggs should be fine! I’m super excited to try these! Have a dozen baking in the oven right now and counting down the minutes!!! Amazing!! Hope you’re loving them, Gwen. Hi Rita! thanks for the recipe. My son doesn’t like chocolate (he is two) , would I just add more oatmeal or something for binding? Hi Julia, no need to add anything else if you don’t want to (more oatmeal would actually make the cookies too dry, I think). If you want to do nuts or dried fruit instead, that would work too!